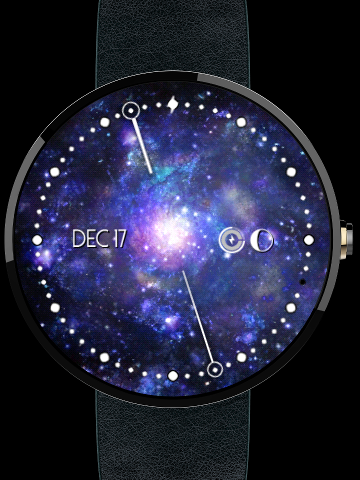 We just updated all five of the current watch faces to v1.1, primarily bringing along the ability to display battery remaining on the watch face. You can see the design on the image to the right, and the functionality is pretty neat really. It can display either the watch or the phone's battery, or both simultaneously -- in the image you see here the inside (darker) ring shows the phone's battery remaining, while the outer ring is the watch. The circles erase themselves counter-clockwise as your battery ticks down. This set of updates also handles some various cleanup tasks, doing things like hiding the compass prefs if the device doesn't support the necessary sensors, enabling mipmaps on the data readouts (compass, battery, moon phase) so they render a little smoother, and fixing a few small bugs.